The almost 250-year Mongol rule over Russia was precipitated by two separate invasions. Following a successful invasion of the Caucasus in 1221, the Mongols invaded a small part of Russia in 1222. 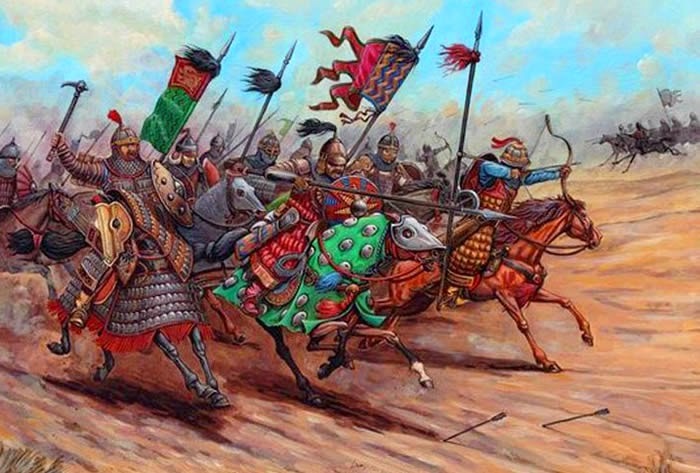 Although a small contingent of the Mongol army succeeded against the ruling princes, they did not establish control over Russia and instead disappeared into the steppe. It was not until 1237 that a sizable Mongol army commenced its invasion of Russia proper, to which all of Russia fell and came under the dominion of the Golden Horde. Having conquered the Muslim empire of the shah of Khwarazm, Jalal-ad-Din Mengubirdi, otherwise known as Sultan Muhammad II, Genghis Khan charged his capable generals Jebe and Subotai to march through the hazardous Caucasus Mountains in the direction of Russia. The Caucasian tribes, the Alans (Ossetians), the Circassians, and the Lezgians, together with the Polovsti, formed an alliance and put up a fierce resistance to the Mongol invaders on the southern Russian steppe in 1221. The first battle between the Mongols and Caucasian alliance proved indecisive, but Jebe and Subotai had no intentions of withdrawing from the engagement. Instead the Mongol generals resorted to using the strategy of divide and conquer. Jebe and Subotai persuaded their nomadic brethren, the Polovsti, to remain neutral by reminding them of their common Turkic-Mongol fellowship and also by promising to share with them the spoils of victory over the Caucasian tribes. With the success of the subtle diplomacy, the generals returned to battle the Caucasian tribes with greater ferocity and overwhelmingly crushed the stubborn resistance. The Mongol generals then turned against the Polovsti, who, in defeat, fled in the direction of Galacia and Kiev and appealed to the Russian princes—Mstislav Staryi of Kiev, Mstislav Udaloi of Galacia, and Vladimir of Suzdal—for intervention. Two sets of crucial factors persuaded the Russian princes to join forces to help the Polovsti. First Prince Mstislav Udaloi was obliged to help because Kotian, the khan of the Polovsti, was his father-in-law. And second according to the Novgorodian First Chronicle, the Mongols were unknown to the Russians—they did not know where they came from, what religion they practiced, or what language they spoke. Fearing that the Mongols would grow stronger if they did not intervene, the princes Mstislav and Vladimir I (Vladimir the Great), together with the Polovsti, forged the Russo-Polovsti alliance. In early 1222 the Mongols received news of the Russo-Polovsti alliance and sent a 10-member diplomatic envoy to negotiate with Princes Mstislav and Vladimir. The Mongols claimed to have no desire to war with the princes and did not harbor any intentions to conquer their lands or cities. In the manner similar to the way they isolated the Polovsti from the Caucasian tribes, the Mongol diplomats urged the princes to defeat the Polovsti and take the spoils of victory for themselves and offered to enter into a peace treaty with the Russians. The princes, suspecting a Mongol trick, executed the diplomatic envoy, an act that was considered by the Mongols to be unforgivable. A strong Russian-Polovsti army of 30,000 soldiers amassed on the Dnieper. 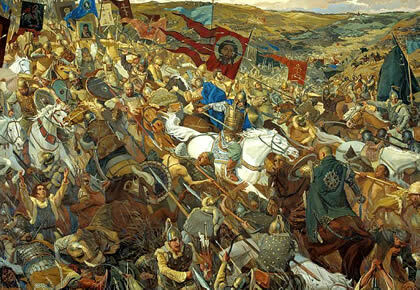 Outnumbered by more than 10,000, Jebe and Subotai ordered the Mongol army to retreat. They dispatched a second diplomatic envoy to meet with the Russians and reproached the Russians for the murder of the first delegation. The second envoy returned unharmed and carried a message for the Mongol army—the Russians feared that, after conquering the Polovsti, the Mongol army would attack them. Hence, they would only be happy if the Mongol army returned to the steppe. As the main Mongol army retreated from the forest, its rearguard kept a watchful eye on the Russian mobilization. War-hardened and accustomed to being outnumbered, Jebe and Subotai managed to evade the Russians for more than nine days. This contrasted sharply with the attitudes of the Russian princes. The Russian army lacked strategic coordination because Mstislav of Galacia and Mstislav of Kiev disputed over the ways to engage the Mongol army. In pursuit of the Mongol army, the Russians were led farther and farther into the steppe and away from their supply lines. Prince Mstislav of Galacia, accompanied by Daniil of Volhynia, commanded the first Russian battle with the Mongol army, defeating the Mongol rearguard at the east of the bend in the Dnieper. Wanting to claim the glory all for himself, Prince Mstislav Udaloi decided to pursue the main Mongol army. Without informing the rest of the Russian army or waiting for reinforcements to arrive, the prince took his army, the Volynian and Polovsti soldiers, across the river Kalka. Overconfident from his victory over the Mongol rearguard, Prince Mstislav failed to consolidate his defenses after crossing the Kalka and fell into a Mongol trap. The Mongol retreat was a strategy aimed at isolating the army commanded by Prince Mstislav of Galacia from those commanded by Prince Mstislav Staryi of Kiev, which was concentrated some distance away from the river Kalka. In mid-June 1222 Jebe and Subotai seized the advantage and ordered an all-out assault on the Russian front and flanks. 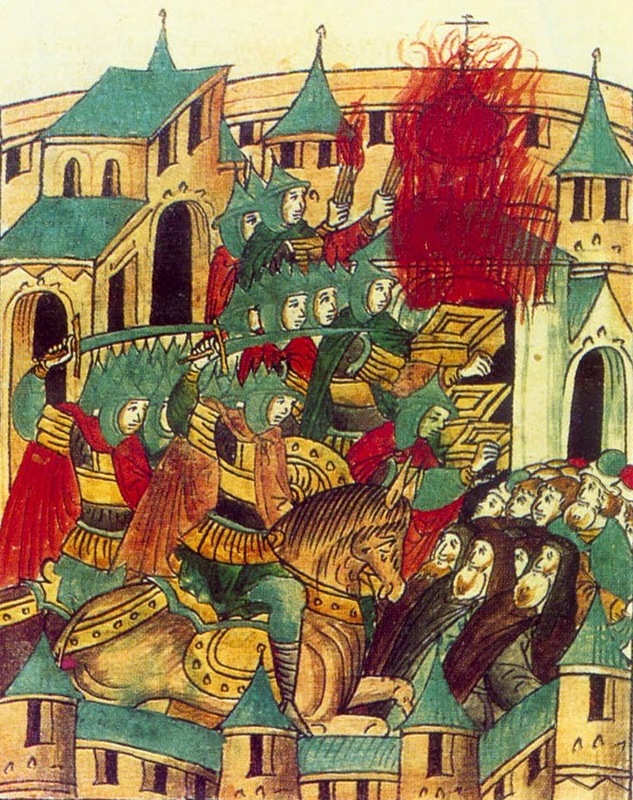 Prince Mstislav of Kiev watched from the western banks of the Kalka as the Mongols launched a ferocious attack against the forces of Mstislav of Galacia. As the Polovsti fled and confusion set in within the Russian ranks, the army of Prince Mstislav of Galacia, unable to maneuver effectively in the marshy terrain, was cut into pieces. The prince, along with the wounded Prince Daniil of Volhynia, a small remnant of his troops, and what remained of the Polovsti, managed to escape. Realizing that a hasty retreat from a swift army is guaranteed to be fatal, Prince Mstislav of Kiev ordered his forces to fortify themselves on a commanding hilltop. But before the prince could securely establish his defenses, Jebe and Subotai attacked. 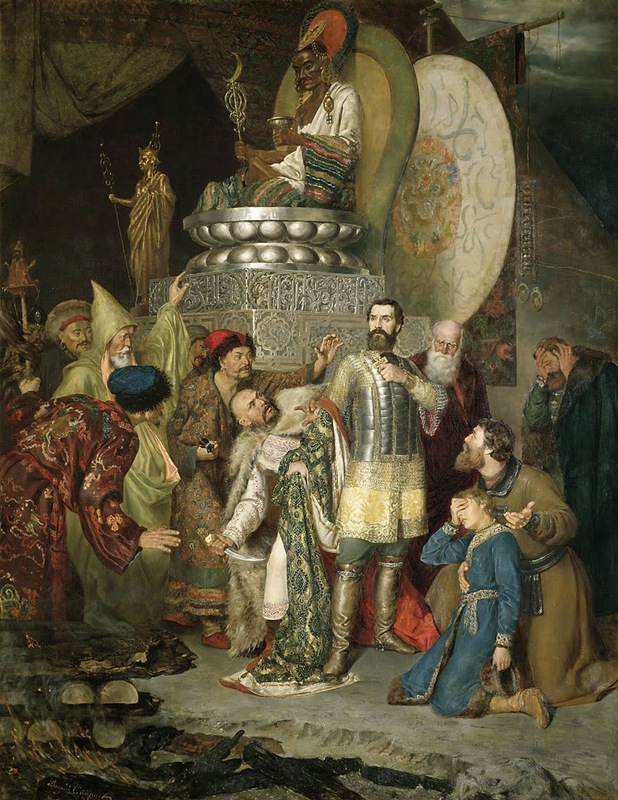 After three days of ferocious Mongol assault, Prince Mstislav of Kiev surrendered on the condition that he and his army would be permitted to return to Kiev unharmed. The Mongol army accepted, but, as soon as the Russian army disarmed, Prince Mstislav of Kiev was executed and his forces slaughtered. Fearing that the Mongols would cross the Dnieper, Prince Mstislav of Galacia and his remaining forces destroyed all the ships. The forces of Jebe and Subotai never crossed the Dnieper and, instead, returned to join the main Mongolian army stationed in the steppes east of the Syr Darya River. Thus by the end of 1222 the first invasion of Russia ended as swiftly as it had begun. In the winter of 1237, well after the death of Genghis Khan in 1227, the Mongol army returned. In the context of a greater invasion of Europe, the Mongol army, headed by the veteran Subotai, amassed some 150,000 to 200,000 warriors. The large army crossed the frozen Volga and attacked the Russian eastern principality of Riazan because it was considered the weakest. As the Mongol army advanced, Prince Roman rushed to Suzdal to ask Prince Yuri for help, which was denied. Instead Grand Prince Yuri suggested that the four princes of the vassal state, Princes Yuri, Oleg, Roman, and Yaroslav, end their squabbling and join forces against the Mongols. After defeating the Russian army at Riazan, the Mongol army constructed a wooden palisade that encircled the town capital of Riazan. After five days of bitter fighting, Riazan was finally captured. The trapped princes and their families were executed, the young women and nuns were systematically raped, and the entire population was massacred. In the winter of 1237–38, under the command of Batu Khan, the Mongol army attacked Suzdal and its capital Vladimir. Although his territory and its city came under siege, Grand Prince Yuri did not intervene. Batu Khan targeted Novgorod while Subotai attempted to draw Grand Prince Yuri into battle. Novgorod, particularly the fortress of Torzhok, fought and resisted the forces of Batu Khan. The ensuing battle lasted two weeks, enough time for an early spring to arrive. The spring thaw flooded most of the southern terrain and made it impossible for Batu Khan to advance. Batu Khan was forced to abandon his siege on Novgorod and retreat to the southern steppe. to do obeisance to Genghis Khan's shrine in the pagan ritual. In March 1238 Grand Prince Yuri and the Suzdalian army perished at the decisive battle against Subotai on the river Sit. With the strongest section of Russia conquered within several months, the Mongolian army sacked the state of Chernigov. Through the summer of 1239 and for one and a half years, the Mongol army rested and sought comfort in the lush steppeland of western Ukraine, in preparation for another campaign. In summer 1240 the Mongol army resumed their offensive against Russia. The cities of Chernigov and Pereyaslav were captured. On December 6, 1240, Batu Khan arrived with his army at Kiev to reinforce the Mongol vanguard commanded by Mongke Khan. After Dimitri, the governor of Kiev, had executed the Mongol ambassadors, the Mongol army stormed the city. Apart from the cathedral of Saint Sophia, the entire city was leveled and its population exterminated. By 1242 the Mongol army had captured all of Russia. Batu Khan chose Old Sarai, in the lower Volga, to establish the headquarters of the Mongol dominion over Russia, which became known as the Golden Horde. The Golden Horde, as a center for the Mongol administration of Russia, endured for almost 250 years. A daruga handled Russian political affairs and the collection of an annual tribute. To become eligible to take office, Russian princes had to journey to the Golden Horde to pay obeisance to Mongol overlords. Contented with being overlords, the Mongols never established a dynasty in Russia. Occasionally, Russian military units had to serve alongside the Mongol army. Despite an attempt by Prince Dimitri of Moscow to wrestle Russia from Mongol control in 1330, they managed to rule and exact tribute for a further century. Ivan III of Moscow finally broke Mongol rule over Russia in 1480. Failing to check the emergence and rise of the Muscovite state, the seed of modern Russia, the Mongols ceded control.